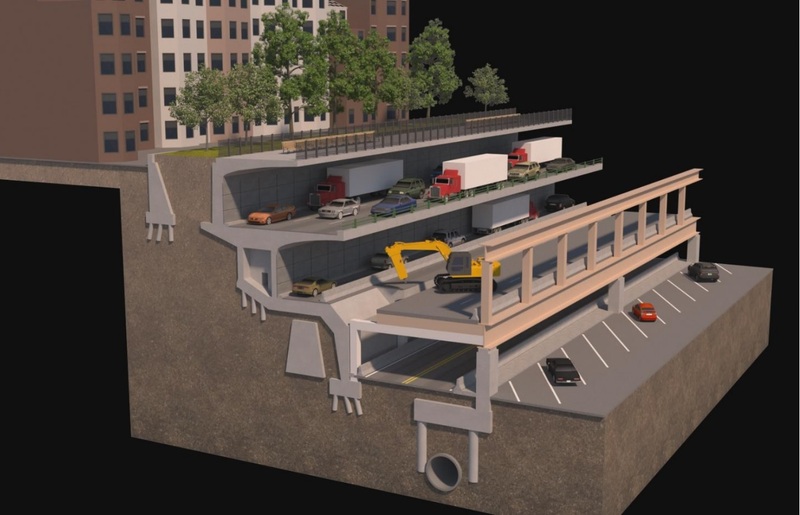 The NYCDOT presented two construction options at their public meeting on September 27, 2018. A video of this meeting is available on DOT’s project website. The presentation includes narration and the complete videos of the proposed design options. You can also download their press packet. 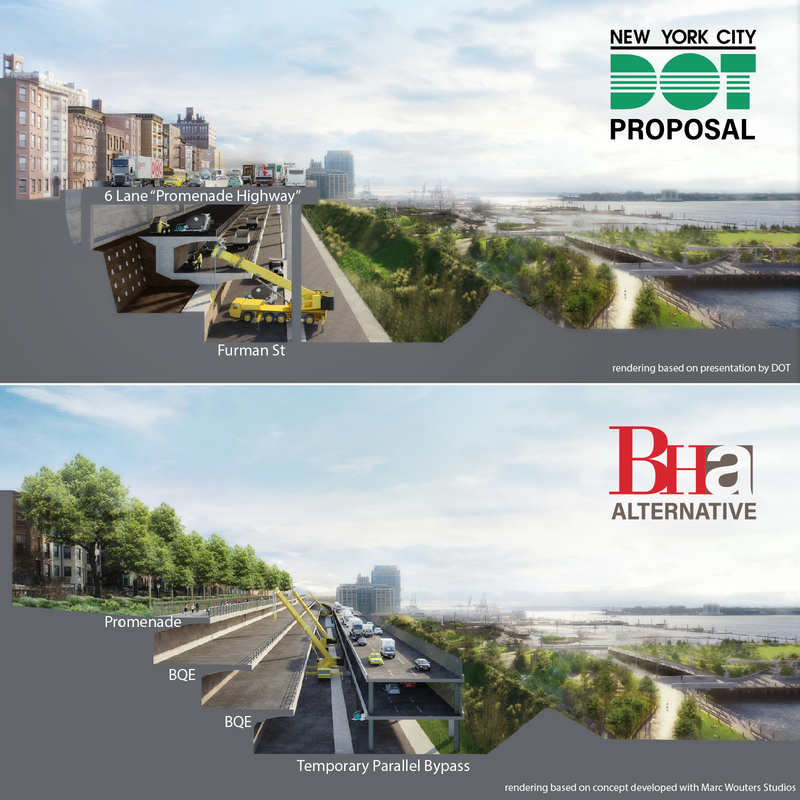 On this page you will find a summary of NYC DOT’s proposal along with an explanation for our opposition to these plans. We have also developed an alternate concept which we encourage you to review, download and share. DOT will limit its footprint, both during construction and when the work is completed, to land which DOT owns and controls. DOT will avoid eminent domain or alienation of parkland. BHA contends this is too restrictive — and DOT admits it already alienates parkland by destroying the gardens behind the Promenade. 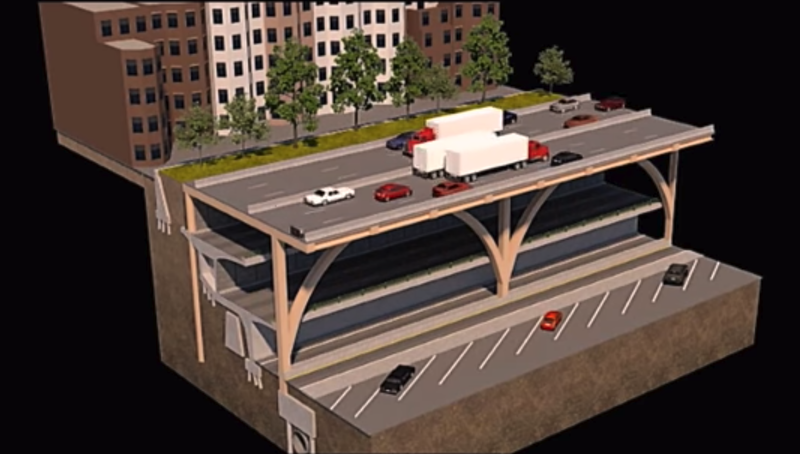 Furthermore the “Promenade Highway” would require support columns to be built in Squibb Park. DOT will avoid any designs or strategies which would require authorization of other agencies. For example, since it has no authority to impose tolls or congestion pricing, DOT will not include these measures as a part of its plan. BHA contends this is too limiting — and DOT admits its plan already requires authorizations by State and Federal agencies. Limiting its options for the sake of political expediency is short sighted, and will result in an inferior solution. DOT will not consider traffic mitigating strategies, either for the construction phase or in the long term. BHA contends a long term strategy is vital for the neighborhood and the region — and that traffic flow must be reduced to avoid back-ups, which will affect the traffic in all of Brooklyn and Staten Island, and ultimately the economy of the entire city and region. 1. Night and weekend work for a minimum of 2 years while the temporary Promenade Highway is being built. 2. Close proximity of over 150,000 cars daily would have devastating impact on the health of the community and to the local economy. 3. The promenade is replaced by a Highway for almost a decade, from the time the temporary highway is built till all the construction is completed between Atlantic Avenue and Sands Street. 4. Access to construction zone is impeded by support columns for Promenade Highway, slowing down the work. To challenge the DOT to develop a better solution, the BHA has proposed an alternative concept which we presented to the DOT in November 2018.